February 8, 9, 10, 11 & 12, 1972. NLeR wrote: “‘What is a cynic Lord Darlington?’ ‘One who knows the price of everything and the value of nothing’. A Quotation from the play you are about to see. Such command of English puts Oscar Wilde amongst the English Classics. In 1892 Oscar Wilde had his first stage success with Lady Windermere’s Fan. The most popular of his plays came later The Importance of Being Ernest and is indeed the most brilliant of his plays. 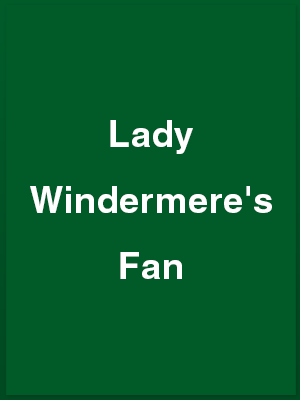 Lady Windermere’s Fan is contrived in plot and couched in mixed language – sometimes sentimental to an overbearing degree – sometimes brilliantly witty. It is probably the most typical of the period in which it is written and should be – must be – observed as such. “Our last production My Three Angels was a great popular and financial success. The result of good team work and a lovely robust set by George Laye which stood up to the assault of the three smiling convicts without a tremor. This new workshop of ours really is paying off! We’re about to invest in some more trucking platforms and by the time Salad Days arrives on the stage you’ll be positively dazzled by mobile pianos, flying saucers and revolving stars! But to return to the reminiscences which have formed our programme theme this season. Raymond Hopper arrived well and truly in 1957 with Happiest Days as the erudite Hopcroft Minor and has proved since, on many occasions, that there really isn’t any limit to his range: from Carnoustie in Sailor Beware  to John Proctor in The Crucible  and Billy in The Poker Session . He has an impressive record in festival-winning plays – Tea and Sympathy, The Glass Menagerie, and Shafers’ The Public Eye. Enough!! I’ll spare Ray’s blushes. Another fine Wick actor in the early 60’s was Adrian Hedges who I’m told still shines on as a bright start over Sittingbourne. From 1956 to 1963 Adrian rarely missed a play. He was a personality and we remember particularly The Heiress  and As Long As They’re Happy . It would be unfair to talk of the improving standards of our plays in the early 60’s without mentioning Betty and Ian Elliott. Betty for her superb comedy timing – Aunt Edie for instance in Sailor Beware and Watch it Sailor – or Sleeping Partner  which incidentally was Ralph Dawes’ first production for the Wick. Ian meanwhile was the organiser who as Chairman and later as Secretary put us on the right management track – and still found time to make a hit as Mr. Bolfry  and the The Queen and the Welshman  and the father in Semi-Detached . We also ventured into the tricky filed of sophisticated revue under Ian’s direction in 1963 but In Fra Dig and Noc Turne rather unsettled our audiences and we have not returned to that jousting ground. OSCAR WILDE’S Lady Windermere’s Fan is a stern test for amateur players, but Wick Theatre Company’s at the Barn Theatre Southwick can be given good marks. The lighting, grouping and timing are right, the background music tones well and there is no masking. The whole cast is audible [which is a refreshing change from what one often finds even from professional companies] although some players are inclined to overact or underact. The sets are well constructed and in keeping with the period. Jean Porter’s Mrs. Erylnne is an excellent portrayal, maintaining the correct restraint and air of dignity. Hilary Wiltshire, as Lady Windermere, is also in character, showing indignation against her husband’s supposed infidelity and then mellowing to her ‘rival’. Ralph Dawes does not come over so well as Lord Windermere, as he does not sustain the necessary authority so essential to the rôle. Something, too, seems lacking in Barrie Bowen’s Lord Darlington and he needs more attack. Douglas Tucker’s Lord Augustus is finely acted and Stephen Moulton’s Mr. Hopper is well contained. Frances Moulton does not suggest the imperiousness of the Duchess of Berwick nor does Barbara Moulton fare too well as Lady Agatha. Other rôles are adequately played by Nikki Le Roy [Parker], Michael Donkin [Mr. Dumby], Miranda Bowen [Lady Plymdale], Mary Payne [Lady Stutfield], Elizabeth Tucker [Lady Jedbergh], Anthony Deasey [Mr. Cecil Graham] and Joy Talmage [Rosalie]. The producer is Nikki Le Roy. The play’s final performances are tonight [Friday] and tomorrow [Saturday]. Although performed with regular frequency Lady Windermere’s Fan is not an easy play to stage, there are far too many pitfalls for the unwary. Wilde’s gift for pungent wit and satire was still developing when he wrote it and although his intention was to mock prudery and false values the work is not sufficiently incisive. Consequently it is sometimes allowed to be played, as with the Wick Theatre Company’s production, primarily for dramatic effects, thus reducing the play to a heavy treatise of sentimental mish-mash. Nikki Le Roy, who produced, used every trick in the book to dramatise and I found some of them rather comic. The stage was thrown into complete darkness periodically to point and effect, as with the entrance of the villainess of the piece Mrs. Erlynne – now she’s gone, now she’s not. Lighting was dimmed or raised at the drop of a whim, bewildering to the beholder and music offstage swelled out at moments of high drama in the best, if old fashioned, tradition. Hilary Wiltshire, blonde shapely and beautiful, played Lady Windermere with considerable grace and style. At no time could she have had anything to fear from the scarlet woman herself. Mrs. Erlynne was played by Jean Porter who certainly gave us more than just a touch of the East Lynne’s. A most attractive set, sadly, did not lend itself to the essential change of scene and how much more attractive are the costumes devised by the company than the exhausted looking creations they hire. Other parts were played by Nikki Le Roy, Barrie Bowen, Frances Moulton, Barbara Moulton, Ralph Dawes, Michael Donkin, Miranda Bowen, Mary Payne, Elizabeth Tucker, Anthony Deasey and Joy Talmage.